Clingmans Dome is not only the highest point in the Great Smoky Mountains National Park, it’s one of the Park’s most heavily-visited sites. 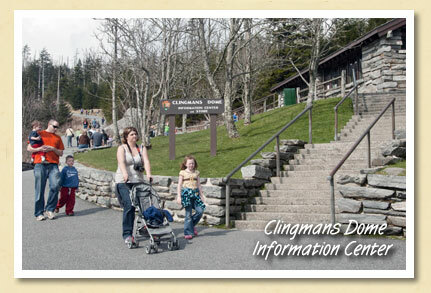 To better accommodate Clingmans’ heavy traffic, the National Park Service recently made a number of upgrades to the mountaintop facilities. The original comfort station, constructed more than 60 years ago by the Civilian Conservation Corp, was renovated and converted into a seasonal information center (above). It also houses a bookstore/sales area managed by the non-profit Great Smoky Mountains Association (GSMA), which funded the renovation project. At 6300 feet, it’s the highest elevation national park visitor center in the eastern U.S.
A new comfort station consists of three sets of vault toilets installed at the west end of the parking area designed to accommodate all visitors, including those with disabilities in accordance with the Americans with Disabilities Act.